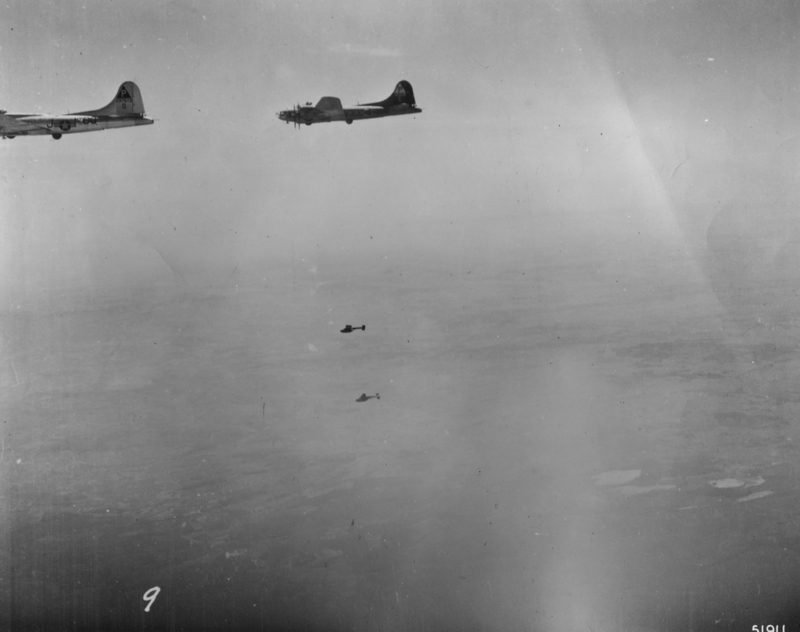 B-17 Flying Fortresses, including (JD-Q) of the 384th Bomb Group fly in formation with two B-24 Liberators during a mission. Official caption on image: "9. 51911 A.[C.]" Printed caption on reverse: '51911 AC - Release line for 2,000 lb. H.E. glide bombs is approximately 20 miles from target. U.S. Air Force Photo.' 28 May 1944, "Grapefruit Mission" B-17G 42-97523, JD-Q and B-17F 42-3441, JD-E, "PATCHES II" aka "SPOTTED COW" The two objects identified as B-24 Liberators are not B-24s. They appear to be two glide bombs. The "Grapefruit" Mission For the second mission of the day - identified as "Grapefruit Mission" in Group records - the 384th Bombardment Group (H) formed the high group of the 41st Combat Bombardment Wing. This was an experimental attack using first-generation glide bombs. The primary target is identified as "Railroad Marshalling Yards" or "Industrial Center of City" in various Group documents. A great deal of practice and experimentation was involved in preparing crews and equipment for this mission. Results were inconclusive; however, it should be noted that the 384th did not repeat an attack of this type again.